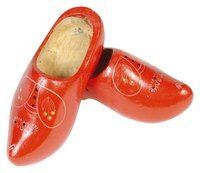 The wooden clog shoe is an iconic image of Dutch life and culture. Though traditional clogs are made from wood, you can make look-alike clogs out of poster board. These paper clogs look like the original wooden ones but are simple in design as they slip over your normal shoes. This project is a great idea for a class project, as a way to teach about the Dutch culture, or even as part of a costume. Print out the template for your paper Dutch clogs. Adjust the size as need to fit the your shoe size. Trace the cut out onto the poster board twice, one for each shoe. Cut out the poster board tracings. Staple the back ends together to form the back of the clog. Fold the tips of the shoes and secure the points with tape. Make a small hole using the tip of your scissors on both sides of each clog. Tie one end of the elastic to one hole. Tie the other end of the elastic band to the other hole. Repeat Steps 8 and 9 for the second clog. Put on the paper clogs and slide them up your leg a bit before you put your shoes on. Slide the paper clogs down over your shoes and secure by placing the elastic band under your heel.